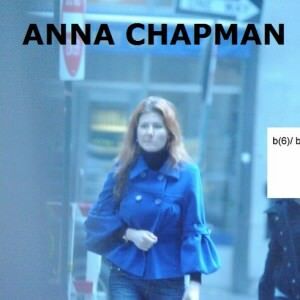 Wearing dark glasses and casually dressed, ANNA CHAPMAN was anxious, sitting down in a midtown Manhattan coffee shop, exchanging small talk with a man she just met. She was worried. Getting a mysterious phone call. Telling her they needed to meet. She thought the gentleman might be an FBI counterintelligence agent, but in reality she didn’t know. Troubling … he implied he knew she worked covertly for Russia’s Foreign Intelligence Service, the SVR … and she was in the United States illegally. Making contact only hours earlier using her cell phone, he said he worked at the Russian consulate in New York City and they needed to meet. The matter was “urgent,” he said, stressing he needed to give her something. Not expecting the contact, much less the phone call, she didn’t want to meet. “Spies don’t meet,” she thought, we use “dead” drops, exchanging information. Meetings were dangerous. Not sure what to do, her first thoughts were to put the meeting off, wanting time to think. But then … thinking maybe something happened, she changed her mind. Protocols were important she thought, but sometimes stuff happens. Putting aside her thoughts about FBI counterintelligence agents, she agreed to a meeting. As CHAPMAN feared, but didn’t know–she and her confederates had become the focus of an FBI counterintelligence investigation looking at the activities of the Russian Federation. FBI counterintelligence agents suspected she belonged to an illegal network of agents, “ordered” to develop ties to individuals responsible for making policy in the United States. The SVR wanted to develop sources and recruit agents so they could collect intelligence. Uncomfortable with the hastily arranged meeting, CHAPMAN told the undercover agent she “need[ed] to get … more information … before … [she could] talk.” Shrugging off her comments, the gentleman repeated he worked in the same department as CHAPMAN … assigned to the New York consulate. He said he knew CHAPMAN was scheduled to return to Moscow in two weeks and was having difficulty with her laptop, unable to communicate with associates. He offered to get the laptop fixed … or she could get it fixed when she returned to Moscow. Needing a plan, CHAPMAN tried to quickly assess her predicament. The gentleman was either the person he claimed, an associate, or worse an FBI counterintelligence agent. She needed time. Handing over the laptop might buy her time she thought. Refusing … she wondered whether she’d make it to the street before being arrested. Of course, her superiors would be “incensed,” but if he was a real FBI counterintelligence agent, anything she had they could take, long before she could could make it out of the country. She thought the facts or scenario left her with few options. Reaching for her shoulder bag, she gave the laptop to the gentleman, asking him to get it fixed. She also agreed to take a “bogus” US passport for another “illegal,” which didn’t make sense to her, but that didn’t matter. She was just trying to buy time. He knew a lot about her, but she didn’t know anything about him. Leaving … she politely agreed to meet the man the following day at a designated spot, using a special signal. Exiting the coffee shop, CHAPMAN was thankful she remembered to bring her dark glasses, making it easier to look up and down the street. Looking around, she tried to spot the FBI surveillance team, but had no luck. The stories she was told about Bureau agents foolishly dressed in business suits or driving government vehicles was “not” true. She didn’t see anybody. She hoped, maybe, just maybe, her new found friend did work for the SVR. Not able to spot or shake the surveillance team, FBI counterintelligence agents observed CHAPMAN purchasing a cell phone and two  calling cards for use making international calls. FBI counterintelligence agents thought she’d use the phone to confirm the identity of gentleman she just met and when she realized he was not an SVR agent … not meet. The following day, CHAPMAN was a no-show, so FBI counterintelligence agents shut down the network, charging her and nine cohorts with being “unregistered” foreign agents operating in the United States. Reminiscent of the Cold War, labeled as Russian spies, approximately one  month later, pleading guilty to criminal charges in US District Court, CHAPMAN ET AL were whisked to Switzerland where they were exchanged for four  Russian intelligence agents in custody, all suspected of being assets for the West. Protecting the United States against foreign intelligence operations and espionage is one of the FBI’s top priorities, second only to preventing the next act of terrorism on U.S. soil. For the FBI Counterintelligence [CI] Program, the years since 9/11 have seen historic events and significant progress in furtherance of national security. In 2001, veteran FBI Supervisory Special Agent ROBERT HANSSEN was arrested and charged with committing espionage on behalf of the intelligence services of the former Soviet Union. U.S. intelligence officials said HANSSEN’s activities resulted in more damage to the FBI than any other spy—causing the FBI to completely revamp its Counterintelligence Program. Since 2001, the FBI Counterintelligence Program has resulted in 249 arrests with 46 individuals being charged with espionage. It was the HANSSEN case that caused the FBI to proactively address the threats posed by the Russian foreign intelligence service [SVR] that resulted in the Bureau discovering the CHAPMAN network. Tightening security and rectifying gaps in intelligence, as a result of the HANSSEN case, the FBI created strong liaison policies within the U.S. intelligence community and mandated that agents develop strong working relationships with their foreign partners, the private sector and academia. secured concurrent jurisdiction to investigate violations of certain munitions and export-control laws. Directory members can be extremely helpful to anyone seeking information and/or requiring a professional opinion concerning investigations involving the FBI Counterintelligence Program. Looking for information about the FBI Counterintelligence Program and/or an expert concerning investigations involving an FBI Counterintelligence Program—please draw upon the website’s search feature, entering the appropriate skill, issue and/or geographical area of preference, and using the information provided, make contact with the listed FBI specialist. Retired FBI Agents and Analysts familiar with the FBI Counterintelligence Program and/or are former FBI Counterintelligence Agents, interested in securing a Directory listing and/or a personal email address, need only submit a brief online application to join the website. Complaint filed with United States Magistrate [USM] RONALD L. ELLIS, Southern District of New York, NYC, NY by FBI Special Agent [SA] AMIT KACHHIA-PATEL charging ANNA CHAPMAN and MIKHAIL SEMENKO with Conspiracy, in violation Title 18, United States Code [USC], Section 371, dated June 27, 2010, Pages 1 thru 4. Ibid., Pages 2 and 3. WASHINGTON POST article captioned, U.S. – Russia Reach Deal on Exchanging Spies,” written by MARY BETH SHERIDAN and JERRY MARKON, dated July 9, 2010. Http://FBI.gov/Counterintelligence. Article captioned, “Ten Years After: The FBI Since 9/11,” dated August 2011.